ETI0001-1255 is being used by the US Navy because of their stringentperformance and reliability requirements. The heavy-duty chassis, occupyingonly 7” (4U) of rack space and 18.5” depth, has rounded metal corners andrugged handles front and rear, aiding in safe handling. The front panel is waterproof meeting the Mil Standards for water dripping onto the front panels. Internally, all majorcomponents are well secured and electrically insulated to prevent damage due toshock and vibration. The internal shielded input isolation transformer, EMI/RFIfilters and input power factor correction minimize both input current andharmonics. 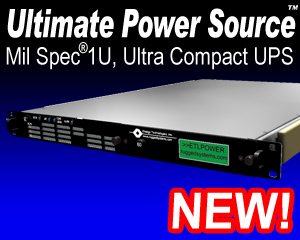 The unit also operates as a frequency converter, taking 46-440 hertzinput and converting it to clean, uninterruptible 60 hertz power. The LED arrays keep the operator informed as to the unit's statusincluding load and battery levels. All controls and protective devices arebrought to the front panel with critical switches having finger guards.Further, all front panel devices are recessed to prevent damage or accidentaloperation. The input switch and the isolation transformer provide double poleisolation for shipboard systems. ETI0001-1255 has the added benefit of having afield replaceable battery via a rear drawout battery module. The batteries are maintenance free with immobilized electrolyte and are constructed of flame retardant materials. For more information, see the Battery Technology section. The Status connector provides aninterface with optional computer software providing loss of AC and low battery status as well asremote shut down capability. ETI0001-1482for a version of this UPS with an integrated PDU and remote control.